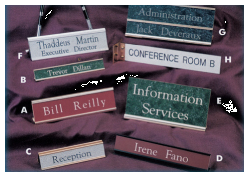 Sign holders are designed in many styles and sizes. Holders are highly polished and anodized in Polished Rose Gold or Polished Silver, enhancing any decor. Styles and sizes are indicated by part number and length.